prof. Ing. Jozef CERNECKY, CSc. doc. Mgr. E. PIVARCIOVA, PhD. A hologram does not have any symbols reminding the displayed object. It is a system of light and dark areas (created by interference of two beams) that even under the microscope does not offer any information about the displayed object. If the hologram is illuminated by daylight the recorded object cannot be identified by the naked eye (the exception is for example the rainbow hologram). And yet the three-dimensional (even colour) image of the object is encrypted in the hologram (Miler, 1974). 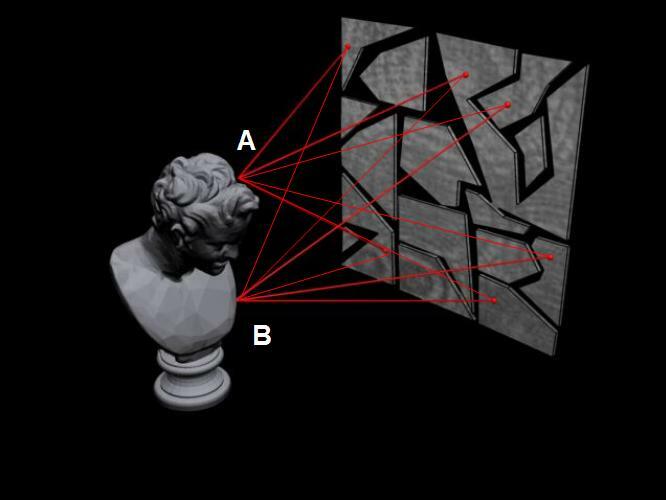 As it was mentioned above, the formation of a visible image through the hologram is called image reconstruction. 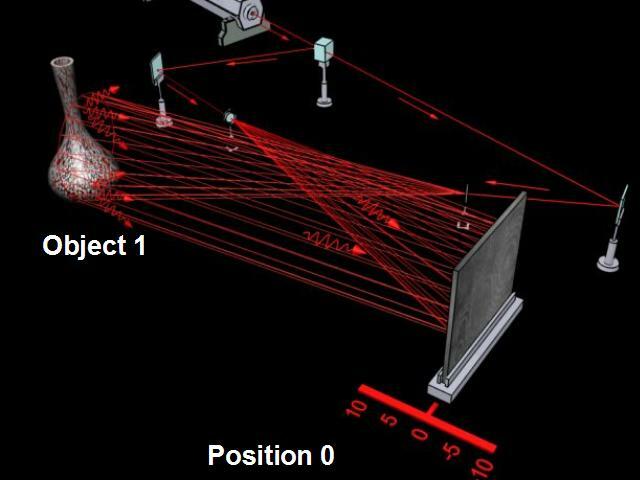 So that the image of the object can be seen in the space, the hologram must be illuminated by the reference beam. 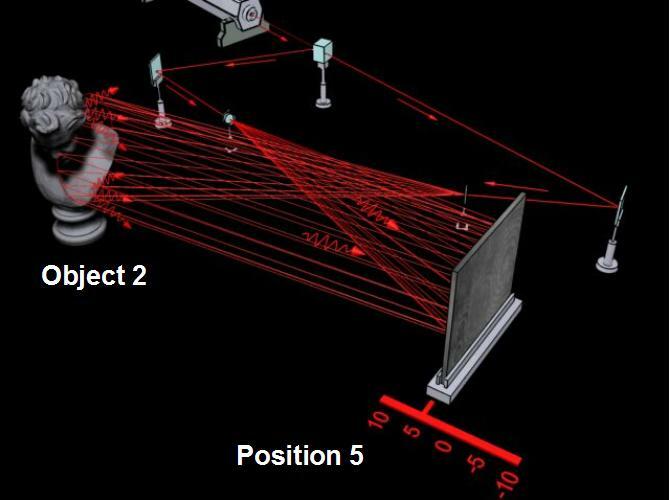 Then the image is created under a certain angle to the incident beam. The observer sees the original three-dimensional object in the space. We can look at this object from various angles like through a window framed by the hologram´s dimensions. The visibility of the object through the hologram is allowed by diffraction of the illuminated reference beam on the grating structure of the hologram. Such observation is accompanied by the parallax – if the point of observation changes the observed object changes its position. If during the exposure some close objects covered the more distant ones the observer now can see the more distant objects with no disturbance by changing their eye position. Holography means recording of the three-dimensional structure of the light wave dispersed by the object. This record is obtained by the interference image that keeps the amplitude ratio of the dispersed light, i.e. relative intensities on which the rate of blackening of dark areas in the interference image depends, as well as its phase ratio defining the mutual distribution of dark and light areas. The photography records only the intensity of dispersed light, i.e. its amplitude characteristics. Information about the phase difference of the beams, i.e. about the distances between various points of the object characterising its three-dimensionality, vanish. If the hologram is cut into several parts, after illumination each of them gives the same image as the one in the whole hologram (if we do not take into consideration that reduction of the hologram dimensions brings about reduction of the image sharpness as well as its three-dimensional perception). This characteristic of the hologram is related to the fact that during the exposure the final optical state in all points of the holographic plate is determined by the influence of the light dispersed by all points of the object surface and, vice versa, the light dispersed by each point of the object illuminates the whole surface of the holographic plate (Fig. 2–7 a). That is why the whole image of the object is encrypted in any small part of the hologram (Fig. 2–7 b). 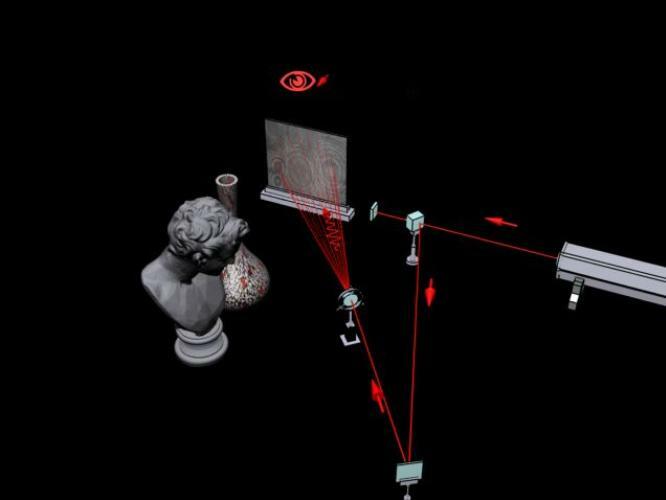 Another curiosity of the hologram is the fact that during the reconstruction only positive images are created. This interesting characteristic is connected with the fact that the image in the hologram is encrypted by variations of interference fringe contrast and distances between them that do not change if negative is changed into positive (or vice versa). We can record more images on the same holographic plate and each of them can be reconstructed without any failures of the other records. 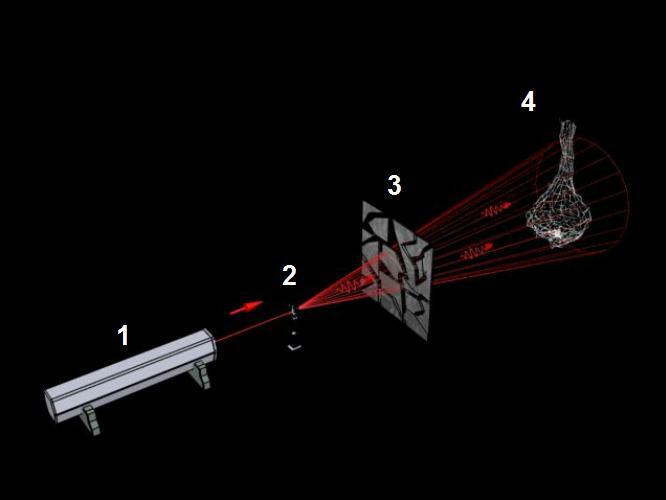 If the holographic images are recorded each from different angles then they can be reconstructed selectively and separately one after another from the same film emulsion if we exactly simulate the original conditions (the angle of the laser beam) used during the exposure (Fig. 2–8). It means that with the change of the view angle the recorded images change as well. We can sense the individual holographic images as mutually separated individual forms, however, such record can be considered a totally non-differentiated field of light that, in consequence of specific interference structure, gives impression of a separate object. Created by: Jozef Lukáč, Based on Peter Oravec script.